Published 2 weeks ago. About a 7 minute read. While momentum builds around improving our food system — what we put in our bodies — chemical giants and savvy startups alike are hard at work creating next-generation products that take just as much care of the environment as they do for our bodies. At this week’s in-cosmetics trade show in Paris, BASF’s Care Creations™ focuses on trends including responsible living or reliable sun care cosmetics, which are reflecting growing consumer needs and driving the personal care industry. “In today’s increasingly fragmented personal care market, consumers expect more than excellent cosmetic products. They want brand producers to recognize their individuality and to offer them tailor-made solutions. We support our customers in detecting the consumers’ individual stories and to address them with suitable offerings,” said Dirk Mampe, VP of Business Management Personal Care Solutions Europe at BASF. Consumers are increasingly interested in the composition and development of their cosmetic products, looking for personal care ingredients that are ecologically sourced, conserve resources or help to avoid negative environmental or social impact. 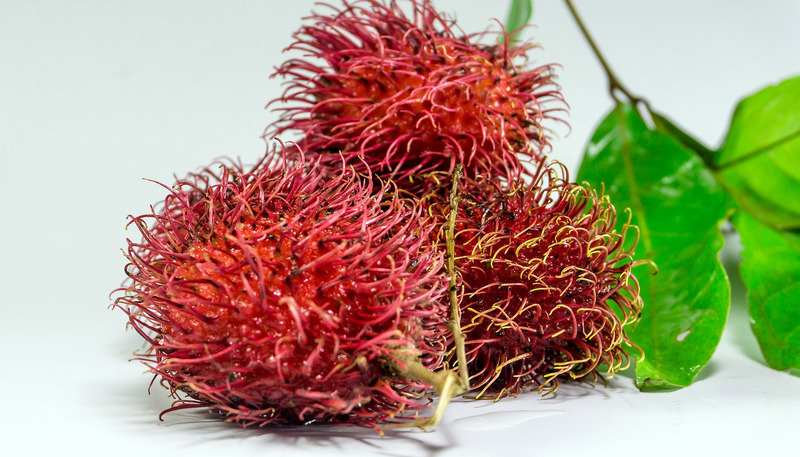 With three new, 100 percent natural bioactive extracts from the rambutan tree (Nephelium lappaceum), BASF can help manufacturers respond to this growing trend, whilst having a positive impact on rural communities in Vietnam, where rambutan is sourced. They are derived from BASF’s Rambutan Program, a reliable supply chain for sustainable bioactives production, upcycling different parts of the tree, other than the fruit. Nephydrat™ is an extract of rambutan peel, which helps to moisturize the skin and provides it with energy; Nephoria™, an extract of rambutan leaves, helps mature skin to rejuvenate by increasing skin elasticity and reducing wrinkles; and for hair care, BASF developed Rambuvital™ from rambutan seeds, which increase hair follicle vitality and reduce sebum oxidation triggered by exposure to pollutants and UV. Dive deep with L'Oréal as the team behind the new Seed Phytonutrients line describes their journey to embed personal wellbeing, ecosystem health and strong community values in all aspects of product development — at SB'19 Detroit, June 3-6. BASF’s Bix’Activ® is its new active ingredient for pure and mattified skin. The extract from Bixa orellana seeds reduces sebum production by restraining the proliferation of sebocytes in sebaceous glands (read: It helps control oily skin) and helps to refine pores and to reduce skin blemishes. A placebo-controlled clinical study demonstrated extraordinary results: The number of active sebaceous glands decreased by more than 50 percent and the follicular sebum excretion rate fell by more than 70 percent. As consumers are increasingly concerned about the impact of conventional sunscreens on the environment, eco-friendly sunscreens are in high demand. BASF’s EcoSun Pass is a methodology that enables a clear, transparent and comprehensive environmental impact evaluation of UV filter systems. It is based on internationally recognized criteria and comprises eight different parameters, from biodegradation and aquatic toxicity to endocrine disruption potential. in-cosmetics’ Formulation Lab® offers R&D laboratory staff the opportunity to learn techniques firsthand from personal care ingredient specialists during interactive training sessions in a fully equipped lab. This year, BASF experts will guide participants in how to formulate a multi-functional skin-cleansing product: a gel-cream that combines a suspension of stabilized shea butter micro-droplets with biodegradable wax microbeads — a sustainable alternative to the conventional plastic microbeads used in a multitude of products, and now banned in parts of the world due to their impacts on waterways and marine life. Next up: the startups — NOHBO LLC today announced a partnership with sustainable biotech giant Genomatica to create a new natural line of single-use, water-soluble personal care drops made with Genomatica’s natural Brontide™ butylene glycol. Reminiscent in concept of the Ooho!, an edible and flexible water “blob” container from startup Skipping Rocks Lab, NOHBO Drops — first showcased in 2016 on “Shark Tank” — are single-use, water soluble drops containing shampoo, conditioner, body wash or shaving cream — the company says formulations of each product are vegan, color-safe, cruelty-free; and free of harsh chemicals, parabens, sulfates, gluten and artificial fragrances. The moisturizing drops — now available in a rosemary mint blend infused with sandalwood, and contain argan oil, aloe and green tea extracts — are activated when mixed with water for 2-4 seconds, and leave behind a pleasantly clean, soft feel and zero plastic waste. Genomatica’s Brontide is derived from a sustainable and renewable sugar fermentation process and is a key material that enables the drops to remain fully encased until it comes in contact with water. Brontide’s unique physical properties aid in the prevention of the formula from dissolving or interacting with NOHBO’s patent-pending, hygroscopic outer film layer, collectively giving the personal care industry a new option for showcasing natural, biodegradable beauty pods. NOHBO’s product launch follows a successful pre-sale period, which generated strong interest from the consumer market as well as inquiries from leading names in the personal care, hospitality and sustainability industries. The company’s new signature 15-pack of 5-milliliter shampoo drops will be shipping direct to US customers in May 2019. NOHBO’s high-performing shampoo drops are the first of several introductions planned for the company’s new line of personal care products, which also includes conditioners, body washes and shaving creams. Standard plastic packaging can take up to 1,000 years to degrade, but NOHBO’s biodegradable, water-soluble film breaks down instantly when met with water. This benefit, combined with NOHBO’s biodegradable, plant-based outer container, enables customers to take a significant step toward zero waste. The packaging also provides an effective moisture barrier, ensuring the integrity of each drop throughout its entire lifecycle. Brontide is ideal for personal care manufacturers looking to develop new natural products or reformulate existing products with a more sustainable alternative to petroleum-based materials. The ingredient integrates seamlessly into personal care formulations — as a humectant, preservative booster, solubilizer or stabilizer — and can be used in a wide range of applications. Brontide is manufactured through an innovative process that uses renewable, plant-derived glucose instead of petroleum-based feedstocks. Genomatica says its unique fermentation process reduces global warming contribution by nearly 50 percent compared to petroleum-based butylene production. Meanwhile, OWA Haircare is another emerging innovator in the beauty space that develops high-quality, water-saving hair products. Its Moondust Hair Wash — what the company calls the planet’s most sustainable shampoo — is a powder that becomes liquid when hydrated with water. Where conventional liquid shampoo formulations are typically around 80 percent water, Moondust Hair Wash contains zero water. After dealing with the inconvenience of traveling with numerous bottles of liquid haircare products, OWA founder Kailey Bradt sought out alternatives to conventional hair products. When she researched what haircare was made up of, she was surprised to learn that they were mostly solvents — for example, shampoo is 80 percent water on average. Her solution is not only better for our suitcases, but for the environment. “I want OWA to spark a new wave of innovation in the beauty industry that considers not only what’s in the bottle, but everything from where it’s sourced to how it’s delivered,” Bradt said. In May 2018, OWA won seed funding from Rochester Institute of Technology Venture Fund I, LLC to bring its innovative powder shampoo to market. Bradt received her Bachelor’s in Chemical Engineering and a Master’s in Product Development, both from Rochester Institute of Technology. OWA expects to bring its waterless shampoo to market later this year. Can We Avoid the Fall of Giants? This Holiday Season, Enjoy Your Festive Brew — While You Can!